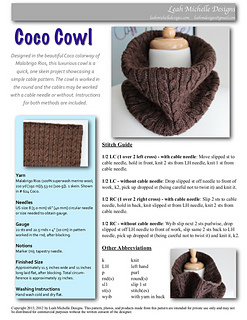 Pattern has been updated (June 2013) to include charted as well as written instructions, instructions for working the cables with a cable needle as well as without, and a list of abbreviations. Yardage: one skein (approx. 210 yds.) of worsted weight yarn. 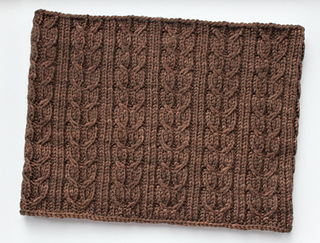 Finished measurements: Approximately 11.5 inches wide and 11 inches tall laid flat, after blocking. Approximate circumference is 23 inches. Required skills: knitting in the rnd, cabling with a cable needle or cabling without a cable needle.